What's the most interesting question about Samsung's upcoming foldable F-series? Is it the price of the first phone in the line? The specs? Nah, it's how did Samsung manage to bend the cover glass without breaking it. like what you see in the LetsGoDigital concept image of the phone above! The first of its kind supply chain analysis of the foldable device has appeared in Korean media, and it gives us the scoop. Samsung has collaborated with the Japenese from Sumitomo Chemical for producing a "luxurious" to the touch transparent polyimide that can be bent numerous times without any visible differences. It will be attached to the flexible OLED panel underneath with an extremely durable and flexible adhesive that Samsung has been developing for years, and which will allow the package to bend at the middle by stretching a bit but not coming unglued. Called optical transparent adhesive film (OCA), this special type of elasticized adhesive can be bent thousands of times and retain its original size and form. 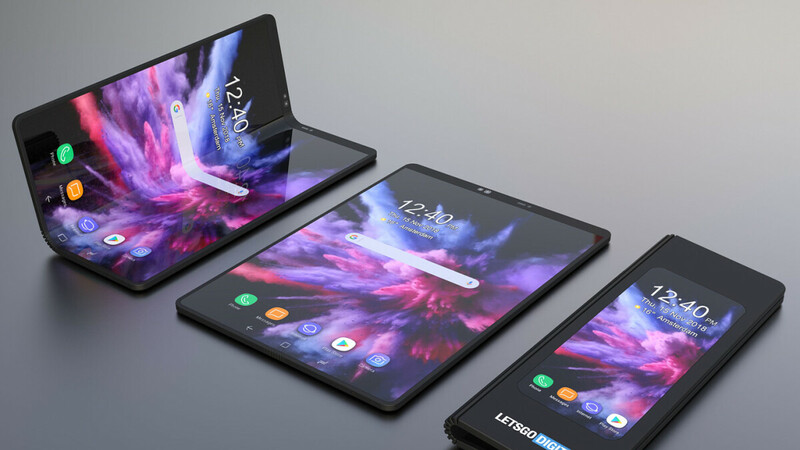 Another Japanese supplier, Nichido Denko, is said to produce the polarizer film for the bendy display, while the organic diodes themselves are of the type used in the current Galaxy S9 or Note 9 models. That sounds like a lot of Japanese technology going into the Infinity Flex display, but at least the stretchy hinge will be sourced locally, from KH Vatec, and we can't wait to fold and unfurl the phone just for kicks. No it doesn't seem much at all, you know what seems much? the amount of samsung components used in apple product, specifically in an iphone. You know what seems much? The amount of ideas and innovation that Samsung just buys or copies from others; Phablet idea AKA Note series -taken from Dell Streak Note screen tech-Wacom Samsung Pay-LoopPay Milk Music-Slacker Radio Infinity display-Toppan FPD Speakers-Harman Kardon Chips-SEMATECH and too numerous to list merchant shops. OS-Google Android Oh and now Samsung will farm out even more component manufacturing; https://www.sammobile.com/2018/11/14/samsung-buy-more-parts-china-galaxy-s10/ Seems Samsung also makes Frankenstein phones. That korean racist boy will get mad at how samsung collaberated with Japanese suppliers and borrowed and created a product together with them that is infinity flex.That why never underestimate Japanese technology against chinese and american,korean technology which sony do uses and configure.Sony and Lg are next to create one with chinese oems. i do feel like these flex screens will scratch easily. Not a Samsung fan, but I gotta admit...I'm interested in checking this thing out. Do you have to be a fan to buy it? Cant you just buy it like most of us buy products? We buy them because we want or need them and that is all that is required. Its idiotic fans who think using another good product somehow makes tou a bad person. They are married to their phone. Using another is like cheating on their wives to them. Flexible and foldable are two different things. That screen in that video would not fold in half like the screen that will be on the folding phone.